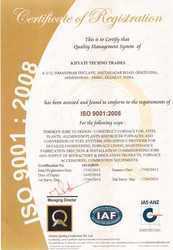 With a perception to make our name glorified & to serve for our clientele, we initiated our firm "United Industries", an ISO 9001:2008 Certified Company established in the year 2007 as an eminent manufacturer, trader and exporter of Heating Equipment and OIl. Our offered range is designed & developed using latest technology in accordance with the approved industry norms, imparted with reduced maintenance requisites, optimum performance ad longer functional life. We have assorted varieties of products under the extensive array inclusive of Cutting Oil, Lubricant Oil and Gear Oil. Offered products are used significantly to cater to the needs of glass industry, cement, metal, chemical and several others. Today, we have become a trusted name and customers’ favorite. We are also offering solutions for Fuel Conversion for industrial furnaces as well as Refractory Lining Services. These services are executed as per the specifications asked by customers under cost-effective budget and deliver assured fruitful results after their final accomplishment. In order to excel in our specified business and to offer our customers, products as per their expectations & requirements, we have developed our workplace over a wide area. There, we have made assortment of advanced range of machinery & tools to accomplish our business tasks in a fruitful way. In the specified process, we are incorporated with our team comprising professionals with years of industry experience and in-depth market knowledge. These personnel carry out the entire working procedure with a keen approach and thus, offer our customers cost-effective solutions for their industry specific needs. It has been our prior requisite to follow stringent quality protocols and thereby, we perform several quality check measures throughout the whole procedure. Our services as well are executed in accordance with the specifications asked by customers with a belief to provide best of solutions to the customers. Working with a belief to make our name reckoned in the industry, we initiated our journey and today, have reached so far & become customers’ favorite. In the process, we have become a global name and have business terms in the overseas market of Africa as well as Latin America. "Mr. Anand Vyas" has been our pathfinder from the day of initiation and has enabled our firm to attain immense success in the specified stream. He along with his enriched experience and impeccable ideas, has helped our team to bring forth unmatched quality products utilizing their intense will & approach to gain success. Our infrastructure is vast and sprawled over a wide area. As engaged in the profound business of manufacturing, trading and exporting heating equipment & rendering its confined services, we have equipped our workplace with latest range of machinery and tools. These facilities are utilized by our expert professionals to bring forth an impeccable range of offerings. Segregation has been made at our workplace resulting in the formation of several departments, responsible for achieving organization’s goals. In our specified business of offering heating equipment products and their confined services, we are supported by team of experienced professionals. These personnel have acquired years of industry experience and are well-aware of the requisites of markets. We have hired our workforce through stringent selection procedure and observing their previous working records. These professionals are competent & hard working, successfully handling our entire venture and satisfying our customers. Our team has been divided into several individual teams, so that tasks must be accomplished with ease & convenience. United Industries is also provide service in the area of heating equipment design / consultancy, fabrication, Erection, Refractory Lining, Fuel Conversion jobs and many other. We help metal, glass, chemical, Cement and Power Industry to set up their heating equipments, vendor management and help them procure quality products for plant machineries and consumables thereof. To offer our customers products of incomparable quality, we are engaged in the specified business and are accomplishing our business tasks following & maintaining stringent quality protocols. Our products & services are offered with the qualitative approach and under cost-effective budget. With a belief to bring forth products of unmatched quality and to offer our customers optimum business solutions, we are engaged in our specified tasks. In the process, we are availed with advanced working facilities and pool of experienced professionals, responsible for satisfying our customers in terms of products offered.